Beautiful remodeled beach cottage! Only 250 ft. from the Sand! This absolutely beautiful, fully-restored beach cottage is located in the heart of Mission Beach only steps from the ocean. This is a very nice, super comfortable, three-bedroom, one-bath, private beach cottage just a 30-second walk to the beach. There is plenty of parking here - hard to find in Mission Beach. We can fit 3-4 cars or 1-2 SUVs. 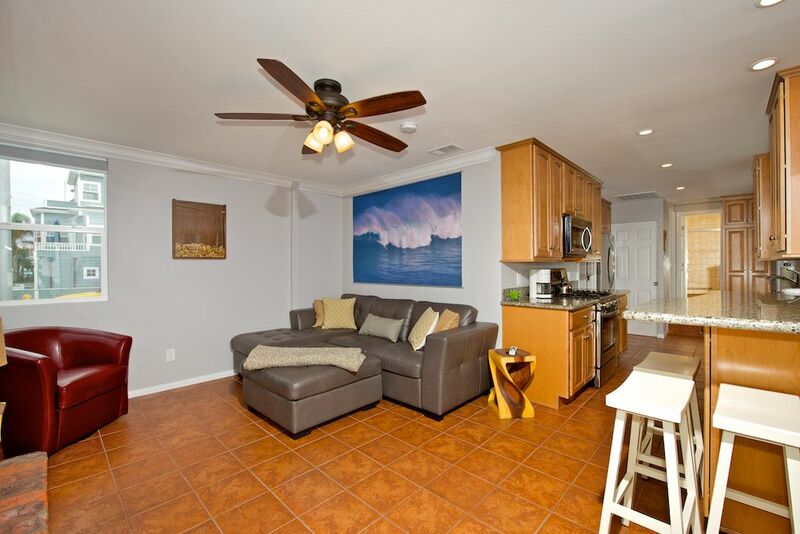 The living area has a gorgeous full kitchen that flows into the dining area and living room. The living area has a fabulous, original brick fireplace, TV, DVD, stereo, and high-speed internet. The French doors open up to a private patio with a brand new, piped-in gas barbecue, outdoor dining area and brand new patio furniture. There is a king in the master, a double and twin in the second bedroom, and a trundle bed in the third bedroom. There is a 3-foot breezeway of double French doors to access the private, third bedroom. There are 4 new, flat screen TVs: a 32' and 42' in each of the bedrooms & a 52' in the living room. There is a real difference between a house like this and a condo with common walls -- no footsteps above you in the middle of the night or voices coming through the walls. And yes, there really is a difference with brand new double-paned windows and French doors. This beach cottage is priced very well for anything comparable this close to the beach. And there are small stores and restaurants within walking distance in this very desirable area of Mission Beach. This is the small town SoCal beach life you have seen depicted for years on TV and at the movies. Come and give us a try! Everything, inside and out is new, as the full-house remodel has just finished. Great location, close to everything. My husband, myself, and our three sons had a great time at this property. The home is very comfortable and so close to the beach! It had everything we required for our stay. The road noise was not as bad as expected. We used earplugs at night as well as fan, and everyone slept well. Our family really enjoyed this house. It is in a great location with lots to do within walking distance and a bus stop right at the house. Great driveway, big enough for a large suv. Only drawbacks were no foul, plastic wrap, etc for cooking and not enough toilet paper. Everything else was well stocked and it was awesome to have the boogie boards and beach chairs at the house. We would definitely stay here again. We stayed with 2 adults and 3 teens. We had a wonderful experience at the house. It was spacious and comfortable for the 7 of us. The kids loved the bunk bed and being able to watch cartoons without parents bothering them. The ease of walking to the beach or the bay was great. The kitchen amenities were perfect for cooking a nice breakfast and lunch. I would definitely stay there again if given the opportunity. Location great for being close to ocean and bay. Not so great due to noise on Mission Blvd starting early due to construction and late night motorcycles. House fit our needs quite well. I read the reviews about the location being a bit loud and you can definitely hear the cars and people on the street but didn’t bother us at all. Great spot on the beach. All amenities we needed, we will be sure to check this spot on our next trip to CA. Thank you!